At Harrogate our members did very well once again, notably our youngest member Cody Smith who won the collerette class in the novices as well as two other prizes. D Fishwick and D Carr also enjoyed success in the novices, while Ray Weeks won best giant yet again! John Jack won the twelve giant decs, with Jack Gott and John Bottomley coming out on top in the waterlily/collerette classes. So well done to everyone for keeping the North West flag flying! Best and reserve giants in show from Ray Weeks. John Jack with his entry which secured him the TW Mawson Cup. 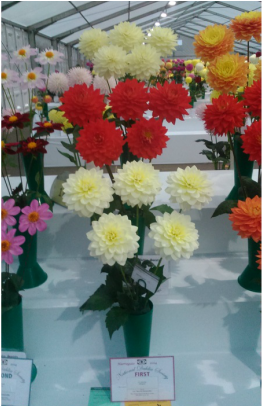 Ray Weeks with his winning entry in the six giant dahlias class. Cody Smith with his winning entry in the collerette class in the novices. PIC: Jack Gott.